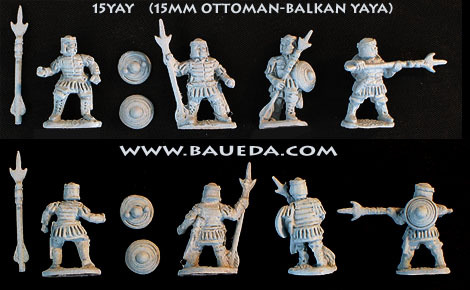 These figures are accurate reproductions of Ottoman-Balcan Yaya as they may have appeared in late 14th - early 15th Century, and are designed especially to be used as Irr Ax(O) in DBM list 55 book IV, Ottoman 1281AD - 1512AD. Being armed with incendiary Javelins they are also suitable as Irr Ps(X) for the same list. 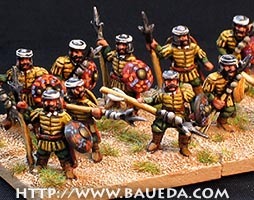 Rather then brigaded separately together as shown here the best use for these figures is to mix them with other figures to give a more suitably irregular look. To this end they are designed as to be compatible with Essex and therefore all most popular 15mm ranges. We also make a 15mm Ottoman tent, make sure to check it out! Each pack contains 8 assorted Yaya on foot in four different poses. All figures are sold unpainted!